Hybrid Infrastructure using Active Directory or Google IDaaS? 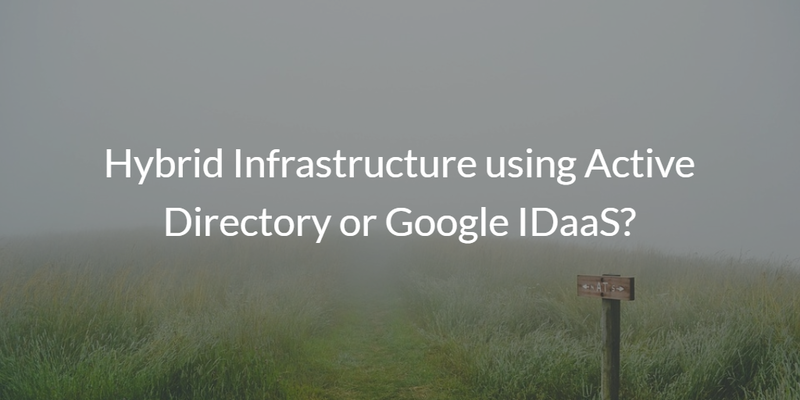 Home » Blog » Hybrid Infrastructure using Active Directory or Google IDaaS? The emergence of the cloud has caused many organizations to implement a hybrid infrastructure. These organizations typically still have many of their resources on-prem. Even if on-prem resources are just systems or applications, moving to the cloud is not as simple as a “lift and shift.” A long term goal of moving to the cloud must include a plan to migrate a company’s IT infrastructure, and that often means having a hybrid environment. As a hybrid infrastructure is implemented, one of the biggest challenges organizations face is properly managing identities in two different worlds – on prem and the cloud. Let’s take a look at why this might be. Roughly 20 years ago, Identity and Access Management (IAM) was a lot simpler. Work environments were dominated by Windows endpoints, and users did not need access to a lot of resources. Then, in the mid 2000’s, the IT landscape experienced some changes. Mac and Linux systems infiltrated workspaces, applications moved to the browser, and the cloud opened wide a new realm for data storage and IT infrastructure. Identity management became a lot more complex with this new and different influx of resources. 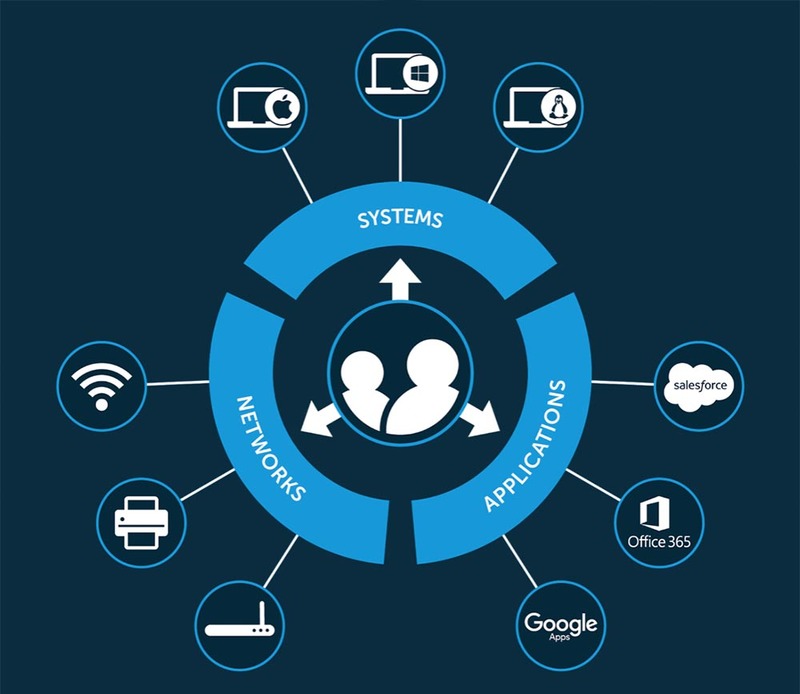 Microsoft’s Active Directory® and Google’s Identity-as-a-Service have tried to solve the identity management problem with their platforms, but neither of them offer a complete solution. Often, an organization running a hybrid infrastructure is leveraging Active Directory (AD) as its IAM system. Active Directory worked great when Windows was the dominating system in the workforce, and user’s resources existed on-prem. These days, the challenge with AD is that you can’t get to the cloud very easily, let alone properly manage user access to cloud storage and web-based apps. Google offers a cloud version of Identity-as-a-Service (IDaaS) called, G Suite Directory. However, G Suite Directory is really a user management system for Google services and an authentication source for a few select web applications. Google’s IDaaS doesn’t connect users to on-prem resources like WiFi networks or systems and it doesn’t connect users to resources that might be held with AWS, Azure, and other Infrastructure-as-a-service platforms. Microsoft and Google are making the transition into the cloud harder for IT organizations. Both options result in IT losing visibility over part of their infrastructure, but there is a third option that brings on-prem and cloud IAM together – Directory-as-a-Service®. JumpCloud’s IDaaS solution can act as a bridge from AD to Google Identity-as-a-Service, while seamlessly connecting users to on-prem and cloud resources. Our cloud based directory gives you the option to eliminate AD and simply leverage JumpCloud’s IDaaS. 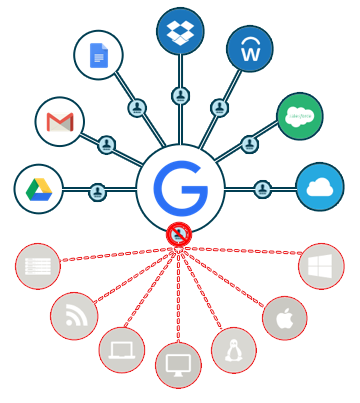 We also tightly integrate with G Suite and Google Cloud to manage users and access to those platforms. If you would like to learn more about how our cloud identity and access management solution can centralize user access to on-prem and cloud resources, drop us a note. You can also start leveraging our cloud based directory in your hybrid environment by signing up for a free account. Your first ten users are free forever.